With the conclusion of Legion just over the horizon, we're taking a look at a pet that you might want to check off your 'to collect' list before the expansion is over. A pet to accompany you both in waking adventures as well as in dreams — the Dream Whelpling. The Dream Whelpling is a unique wild pet. It only spawns inside the level 110 instanced raid zone, The Emerald Nightmare. Thankfully, it's not too difficult to get to, but if you don't want to wait until we vastly outgear the content, it might be smart to collect this pet now while there's still mild interest in the raid. To spawn the Dream Whelpling, you'll need to defeat the last boss, Xavius. This can be done in LFR, Normal, Heroic, and Mythic difficulties. After Xavius is dead, you'll be automatically transported to the green, pristine version of the Emerald Dream. It's in this specific area that this pet resides. There are only a handful of Dream Whelplings up at a time, all level 25, with two adds that are also Dream Whelplings. These wild pets do respwan in all difficulty levels of the raid, so take your time looking for your perfect whelpling. Whether for battling, companionship, or as tribute to the events that transpired in Val'sharah, this is a lovely pet to keep by your side. "Beautiful dreamer", indeed. The Dream Whelpling is a great pick up with a set of good core Dragonkin moves. Well, its first move, Emerald Bite, is technically Magic, but it's a fairly common one among green dragons. We always discuss how important an off-family ability can be, and this time it's no different. 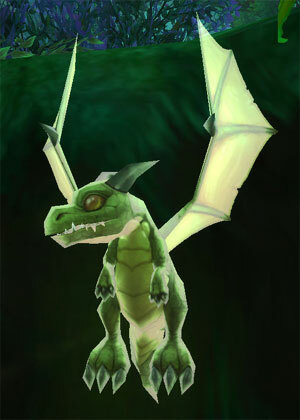 Green dragons are the go-to Flying pet killer, and the Dream Whelpling definitely has a slot on many of my Family Familiar teams for this ability alone. The longevity this whelp brings is also crucial to that spot on my team. Healing Flame and Emerald Dream share a slot with powerful healing, while Emerald Presence is a powerful shield in certain circumstances. If your opponent has abilities which hit multiple times, or a damage over time spell, Emerald Presence will frequently absorb most of it. Again, this tends to be great against Flying pets, which pack abilities like Slicing Wind. The ability sharing slot 2, Toxic Skin, is kind of the DPS version of Emerald Presence. It doesn't protect your Dream Whelpling at all, but it deals 5% of your opponent's max health back to them each time it hits your Whelpling. This includes DoTs. 5% of the health of a pet with 1400 HP is 70 damage per tick. Personally I almost always opt for the shield, but there are definitely times that DPS is appealing. The final ability in its kit is one that breaks my heart. A while back, Sleeping Gas was nerfed from a ramping up DPS monster to a one-round cooldown bore. Literally — it has a chance to sleep the target. This ability and Frog Kiss were two of my favorites, because it rewarded your pet for hanging in there. Now, because you can only cast it every other round, it never really reaches the deadly heights it used to. C'est la vie. You'll want to try to get your Dream Whelpling in a P/P breed. 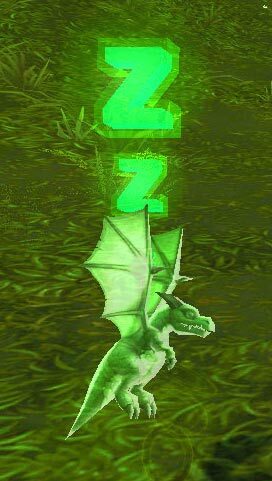 Both the Emerald Whelpling and the Emerald Proto-Whelp share many of the same moves if you don't manage to snag one.